Nikki is a private investigator with a knack for finding lost people. It's a skill she's had since she was little, and one she's been unable to explain...until now. A betrayal by a client throws her headfirst into a world she never knew existed, one filled with warring gods and godlike powers. Come to find out, she's a descendant of the goddess Artemis, which explains the awesome tracking abilities. Along with her, there's a group of people, also descendants of gods, who she's been forced to cohabit with. Living with them might not have been so bad if she hadn't accidentally run over a friend of theirs with her car. To make matters worse, she has a warring faction of people with godlike powers trying to steal her, a housemate who'd like nothing more than to see her dead, and a sister to hide her new powers from. To top it all off, she's promised to find her new leader's wife who's been kidnapped by the enemy and missing for ten years. Let's see, dealing with bloodthirsty enemies--check. Dealing with bloodthirsty allies--check. Guess she shouldn't have thought her old job was boring. 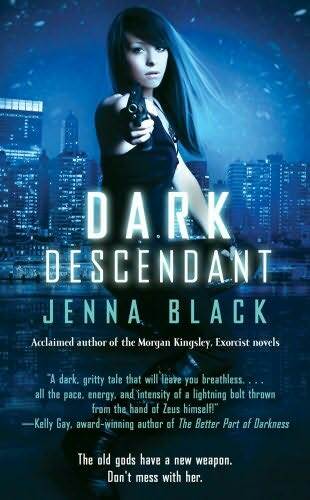 I've read Jenna Black's Morgan Kingsley series, and I loved them. While scouring the bookstore shelves trying to find a book for Annette and I to read, I saw this and figured, "Hey, let's give her new series a try. Descendants of gods and goddesses sounds a bit strange, but I've seen weirder plots in books that work, so let's give it a try." It took me a few chapters to get into it, and let all the characters get introduced. Once that happened, it really started to get good. It's more about sleuthing than anything, although there are a couple scenes where lightning bolts are thrown, which was awesome. Poor Nikki goes through Hell (not literally) in such a short amount of time, yet somehow she finds the strength to get out of bed in the morning and face the day. Sure, she has a panic attack or two, but if I was in her situation, I'm sure I'd be freaking out too. Long story short, Jenna Black is a great author, and I think once I have more than one book in this series to plow through, it will be truly awesome. It took me some time to really get into this book and to be honest I cannot quite put my finger on the reason why. This is my first book by Jenna Black I have ever read although I know plenty of people who say she is amazing but this book was so-so for me. I would get into and then it would loose steam. The storyline and characters were great and I will read book two to see if it grows on me.